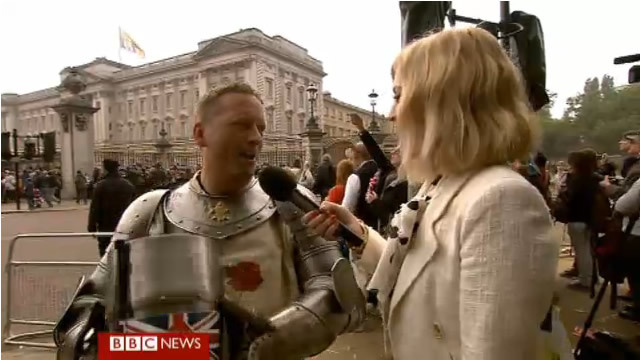 Yesterday during the Royal Wedding coverage while the world waited for the Duke and Duchess of Cambridge to appear on the balcony our knight was interviewed by Fearne Cotton of the BBC. Sadly Fearne wouldn’t let Colin plug the website, however that didn’t stop many people finding us and making donations to Chestnut Tree House. Hey @BBCNews, tell Fearne she should've let that knight tell us the charity website. The miserable wench! Colin and the team have been overwhelmed by the support that we have received from all over the world. Everyone that has donated and supported Colin on his journey has our heartfelt thanks. This entry was posted in Lonely Knight, Media Coverage. Bookmark the permalink.